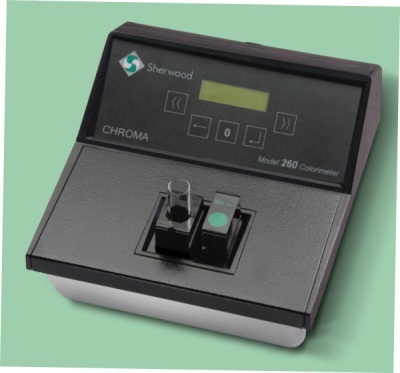 The basic design of the Sherwood CHROMA Colorimeter has been stable for several years and they have an enviable world-wide reputation for rugged performance. For the 21st century Sherwood Scientific has reduced the range, updated its Photometers and added a software package unique in this class of instrument. The Model 260 Colorimeter offers features not elsewhere available and provides solutions to the requirements of quality control, water testing and for the clinical chemist for low sample runs. The Model 260 can be battery powered and thus can be used outside the Laboratory. This Model M260 replaces the CHROMA 257 Colorimeter and incorporates full programmability allowing up to 100 methods to be installed by the user. This permits semi-automatic operation with the user only required to insert the prompted filter. An RS232 output allows the use of a serial printer and every result, blank and calibration is time stamped. The unit allows quick Absorbance and Transmission measurements with Auto-Zero, Concentration with Standard Solutions or Factor as well as the new Kinetic Reaction Rate and End Point methods. The Model 260 Colorimeter has two options to control the temperature of reactions. The low cost option is to use external temperature control by means of solid block heating. The software built in to all three of the new models includes the setting of Incubation (or lag time) and Measuring time. Towards the end of these times the user is alerted to return the cuvettes containing the blank sample or calibrant to the colorimeter by means of a buzzer. The relevant reading is taken and the cuvette is returned to the heating block to complete the rest of the test. Sherwood has also developed an electrically heated cuvette holder (267 86 001) designed specifically for the micro cuvettes (001 26 120). This is able to control the temperature to 37 °C ± 0.1°C. and is available as an option.